Find out why your yoyo won’t sleep at all. Why Won’t My Yoyo Sleep At All? Yoyo TrickIn this video I am going to try to address the questions Why Won’t Your Yoyo Sleep, and help you figure out how to get your yoyo sleeping again if it even can do that. Now sleeping, of course, is any time the yoyo spins down at the bottom of the string. Of course, you can bring the yoyo back up. Sleeping is the foundation for all kinds of tricks. It can be really frustrating if you get a yoyo and it used to be able to sleep and it no longer can sleep. It is going to make learning a lot of tricks impossible if you can’t get that right, so in this video I am going to try to show you how to get your yoyo to sleep again. I am going to look at 4 different types of yoyos and I am going to address why it won’t sleep in each case. I am going to address them in this order, so if you know what kind of yoyo you have, you can just skip ahead in the video and try to find the section where I talk about the yoyo that you have. The four types of yoyos I am going to talk about are cheap yoyos that you might get at a dollar store, or something like that. Fixed axle yoyos, these are any yoyos that are made of wood, or your less expensive Duncan yoyos like the Butterfly or Imperials, something like that. Then I am going to be talking about Brain yoyos, and finally ball bearing yoyos. The first yoyo that may not sleep when you get it is what I just call a cheap yoyo. This is something you get at a dollar store, or if you go to some sort of event like a car show, and they give away yoyos for free, with General Motors or Ford written on it. This is a yoyo that you have not paid that much money for. Maybe somebody gave you a yoyo as a gift and there is no logo at all on the side of the yoyo, almost like the company is too embarrassed to own up to the fact that they made this product. All of these types of cheap yoyos may not sleep at all. If you have gotten one of these and it cannot sleep it may be just because it has been designed poorly or cheaply, and the yoyo itself just can’t sleep. 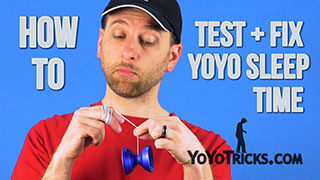 So, if you want to start learning tricks on YoTricks.com you are going to need a yoyo that can sleep. We have all kinds of yoyos for players of all different skill levels. We suggest that you check those out. 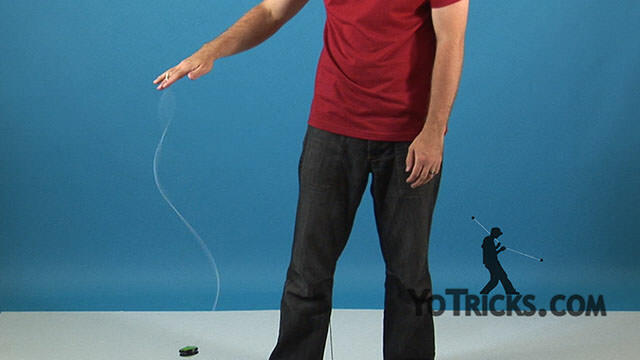 You can learn how to get a yoyo to go up and down with a cheap yoyo, but that’s about it. The next type of yoyo is, you may have gotten a fixed-axle yoyo. The Lightening Yoyo, this is a wood yoyo that we carry on YoTricks, this is a fixed-axle yoyo. Any yoyo that has a wood axle, also your Butterfly yoyo, your Imperial yoyo, your inexpensive, common Duncan yoyos. Not all Duncan yoyos, but the less expensive ones that you might find at a drug store, or a grocery store, something like that. These yoyos, if you get one of these, they should be able to sleep. A lot of times when you first get a yoyo like this it sleeps and it is just fine, and then as you are using it and as you are using it over time, all of a sudden it will just stop sleeping. And you are wondering, why isn’t my yoyo sleeping? What may have happened is your string may have gotten too tight. You can know if this is what happened if the string has gotten like this. What that means is that the string has gotten wrapped so tightly around the axle that it is no longer free to spin freely. That’s why it won’t sleep. We have a trick called the UFO that you can learn that can help you loosen the string so that the yoyo can sleep again. Just like that. Another way that you can deal with a string that is too tight, especially if you are a beginner, is you can just take the yoyo right off your finger and you can just pull the string out like this and let the string hand at the bottom. You can see it is untwisting. When you bring it back together you will see, most of those twists are out. The yoyo should be able to sleep after that. If it is still not sleeping you may have gotten a knot around the axle. You might need to either cut that out or replace the string or something, that should be able to do it. You may also have put the string on wrong, so you are going to need to learn how to put the string on. Basically, for a fixed axle yoyo, all you want to do – you will want to get a yoyo string, other string won’t really work – but you just want to put the string on one time, just like that. That should allow the yoyo to sleep. 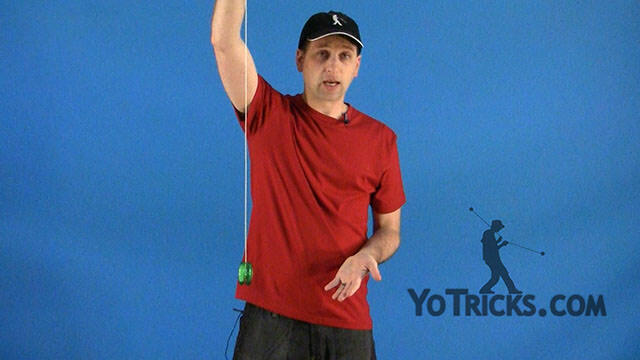 If you need help with getting the yoyo on the string the right way, we have another video about adjusting your string that will show you how to do that in a little bit more detail. The next kind of yoyo that you may have is a Brain yoyo. A Brain yoyo is any yoyo that has this kind of mechanism in it and that clutch system is supposed to allow the yoyo to be a little easier to use. If it is your first yoyo you may wonder how come you can’t get it to sleep even though you know these types of yoyos can sleep. The way this mechanism works is you actually have to throw the yoyo hard enough to be able to get it to sleep. That is actually the way the yoyo is designed. The way this clutch works, is it grabs onto the axle when the yoyo is not moving, or when it is moving slowly, and the more powerful you throw it that clutch system opens up and allows the axle to spin freely. Once the yoyo slows down those clutches come in, they grab the axle and they bring the yoyo back up without you ever even pulling the yoyo up with your hand. Just like that. If you have gotten one of these yoyos, you have not been able to get it to sleep, I suggest you checkout our video about the basic throw. We give you a couple different techniques to improve your throw, to get it some more power, so that you can get the yoyo to sleep. If you know that you are throwing it hard enough and it is still not sleeping you may have put the yoyo together wrong, so you can checkout the packaging on the yoyo so you can see if you can figure out how it is supposed to go together. We also have a review of the Yomega Brain, where we show how to put it together, so you can also check out that video. Hopefully that will help you out. The last kind of yoyo which is becoming the most popular kind of yoyo these days, most of our yoyos on YoTricks are like this, is the ball bearing yoyo. 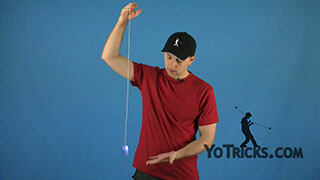 The is the Luminator, which is the yoyo we use to teach just tons and tons of our tricks on YoTricks. It is good if you are just getting started learning some string tricks and stuff like this. If you have gotten one of these yoyos and it was sleeping find and all of a sudden it has stopped sleeping you may wonder, again, Why isn’t my yoyo sleeping anymore? With these yoyos, probably the most common thing that happens is, as you are using it, maybe you want to take it apart, or maybe it fell apart while you were using it, and then you put the yoyo back together and it stops sleeping. What happens a lot of times with beginners is they want to put the string on the bearing while the yoyo is apart. Once they put the string on, they push it on, try to get it on there just right, then once they get the string on they screw the yoyo back together. What they don’t realize is that the string has slipped off the bearing a little bit and now the string is caught in between the bearing and the yoyo. It can’t move freely and allow the yoyo to spin. The way you solve this problem is, you should not put the string on the yoyo while the yoyo is apart, instead you should put the yoyo together first and then you open up the string and put the yoyo right on the string just like that. That will make sure that the string doesn’t fall in between the bearing and the yoyo. Another thing that can happen is, if the bearing gets a little bit loose while you are playing with it, and you notice it so you tighten it back down, always make sure to check to make sure the string did not get caught between the bearing and the yoyo. That can happen if it loosens up a little bit. Sometimes if your string is a little too old, it might be getting a little bit thin, so the same thing can happen even if the yoyo has not come apart at all. In that case you are just going to need to change the string. A lot of times if you have been playing with it with the string caught between the bearing and the yoyo the string might get a little bit cut, so you might want to change it if that happens because the string might break on you pretty quick. Another thing that can happen with a ball bearing yoyo is if you take it apart, maybe you don’t realize that there is a bearing in there, you’ve lost the bearing. If you put the string on and try to throw the yoyo that way the yoyo is not going to sleep either, because the yoyo is meant to sleep on the ball bearing, but the little metal bearing inside is gone so it is just the string sitting on the plastic, and that doesn’t really work at all. 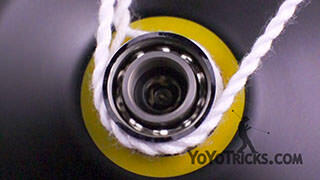 If that is the case we have replacement bearings on YoTricks that you can checkout, and that should solve the problem. I hope this video has been helpful. If you have any other questions about why your yoyo may or may not sleep just let us know, but these seem to be the most common reasons. We hope that helps you out.